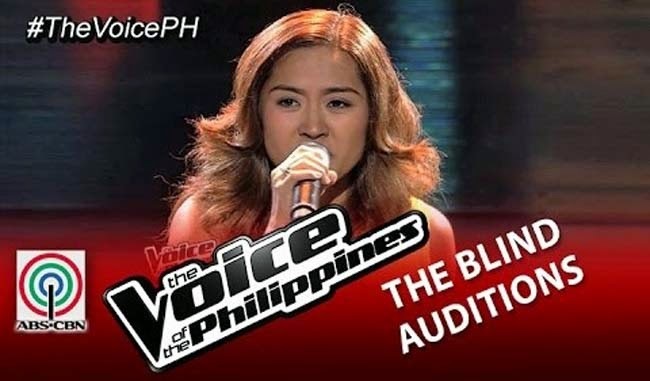 Abby Pineda, 33 years old from Paranaque City was the 2nd artist who made it to the Blind Auditions of the November 29, 2014 episode. Abby, though she was not able to get a formal voice lesson to develop her talent in singing can perform well. Abby’s greatest motivation in pursuing her career was her family. Whenever she will join a singing contest, she always has his family ready to support her. She has high dreams for her family and she desires to give them a good life. This talented artist did her best in order to convince the coaches to turn their chairs by pushing the red buttons. She performed the Michael Jackson hit “I Just Can’t Stop Loving You” with her own version. While Abby was signing, the coaches were trying to figure out the reasons for them to turn their chairs. The song was about to end and the coaches were still listening attentively. In the end it was Coach Apl.de.ap who turned his chair. Coach Bamboo explained that he was almost there to push the red button but he did not make it on time. Coach Lea said that she lacked on the part of showing that she was in love. The coach explained that she needed to show that and to let other people know that she was in love. The coach who turned his chair gave a lot of good comments to the artist although there were things that, according to him, were needed to be developed. Coach Sarah said that she has high respect on the late Michael Jackson that is why the song was something for her. On the other hand, Coach Apl.de.ap liked the quality of her voice and he considered her a challenge to him.